The wind is a free energy resource, until governments put a tax on it, but the wind is also a very unpredictable and an unreliable source of energy as it is constantly changing in both strength and direction. To produce useful amounts of power, wind turbines generally need to be large and tall, but to work efficiently they also need to be well designed and engineered which makes them expensive too. 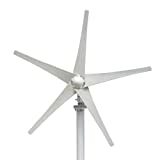 Most wind turbines designed for the production of electricity have consisted of a two or three bladed propeller rotating around a horizontal axis. It’s obvious to say that these propeller like wind turbine blade designs convert the energy of the wind into usable shaft power called torque. This is achieved by extracting the energy from the wind by slowing it down or decelerating the wind as it passes over the blades. The forces which decelerate the wind are equal and opposite to the thrust type lifting forces which rotates the blades. Just like an aeroplane wing, wind turbine blades work by generating lift due to their curved shape. The side with the most curve generates low air pressure while high pressure air beneath pushes on the other side of the blade shaped aerofoil. The net result is a lifting force perpendicular to the direction of flow of the air over the turbines blade. The trick here is to design the rotor blade in such a way as to create the right amount of rotor blade lift and thrust producing optimum deceleration of the air and therefore better blade efficiency. If the turbines propeller blades rotate too slowly, it allows too much wind to pass through undisturbed, and thus does not extract as much energy as it potentially could. On the other hand, if the propeller blade rotates too quickly, it appears to the wind as a large flat rotating disc, which creates a large amount of drag. Then the optimal tip speed ratio, TSR, which is defined as the ratio of the speed of the rotor tip to the wind speed, depends on the rotor blade shape profile, the number of turbine blades, and the wind turbine propeller blade design itself. So which is the best blade shape and design for wind turbine blades. Generally, wind turbine blades are shaped to generate the maximum power from the wind at the minimum construction cost. But wind turbine blade manufacturers are always looking to develop a more efficient blade design. Constant improvements in the design of wind blades has produced new wind turbine designs which are more compact, quieter and are capable of generating more power from less wind. Its believed that by slightly curving the turbine blade, they’re able to capture 5 to 10 percent more wind energy and operate more efficiently in areas that have typically lower wind speeds. So which type of blade shape would produce the greatest amount of energy for a wind turbine? – Flat blades are the oldest blade design and have been used for thousands of years on windmills, but this flat broad shape is becoming less common than other types of blade design. The flat blades push against the wind, and the wind pushes against the blades. The resulting rotation is very slow because the blades that are rotating back on the up stroke after generating power are in opposition to the power output. This is because the blades are acting like huge paddles moving in the wrong direction, pushing against the wind giving them the name of drag-based rotor blades. However, flat blade designs offer significant benefits for the DIY’er compared to other wind blade designs. Flat rotor blades are easy and cheap to cut from a sheets of plywood or metal ensuring that the blades have a consistent shape and size. They are also the easiest to understand requiring less design and construction skills, but there efficiency and the ease of generating electrical power is very low. Curved blades are very similar to a long aeroplane wing (also known as an aerofoil) which has a curved surface on top. The curved blade has air flowing around it with the air moving over the curved top of the blade faster than it does under the flat side of the blade, which makes a lower pressure area on top, and therefore, as a result, is subjected to aerodynamic lifting forces which create movement. These lifting forces are always perpendicular to the curved blade’s upper surface which causes the blade to move rotating around the central hub. The faster the wind blows, the more lift that is produced on the blade, hence the faster the rotation. The advantages of a curved rotor blade compared to a flat blade is that lift forces allow the blade tips of a wind turbine to move faster than the wind is moving generating more power and higher efficiencies. As a result, lift based wind turbine blades are becoming more common now. Also, home made pvc wind turbine blades can be cut from standard sized drainage pipes having the curved shape already built-in giving them the best blade shape. But curved blades also suffer from drag along its length which tries to stop the motion of the blade. Drag is essentially the friction of air against the blade surface. Drag is perpendicular to Lift and is in the same direction as the air flow along the blade surface. But we can reduce this drag-force by bending or twisting the blade and also tapering it along its length producing the most efficient wind turbine blade design. The angle between the direction of the oncoming wind and the pitch of the blade with respect to the oncoming wind is called the “angle of attack”. As this angle of attack becomes larger, more lift is created but as the angle becomes even larger, greater than about 20o, the blade will begin to decrease lift. So there is an ideal pitch angle of the rotor blade that creates the best rotation and modern wind turbine rotor blades are actually designed with a twist along their length from a steep pitch at their root to a very shallow pitch at their tip. As the speed at the tip of a rotating blade is faster than it is at its root or center, modern rotor blades are twisted along their length by between 10-to-20o from root to tip so that the angle of attack decreases from where the air is moving relatively slowly near to their root, to where it is moving much faster at the tip. This blade twist maximises the angle of attack along the length, getting the best lift and rotation. In conclusion, a wind turbines rotor blade length determines how much wind power can be captured as they rotate around a central hub and the aerodynamic performance of wind turbine blades is very different between a flat blade and a curved blade. Flat blades are cheap and easy to make but have high drag forces making them slow and inefficient. To increase the wind turbine blade efficiency, the rotor blades need to have an aerodynamic profile to create lift and rotate the turbine but curved aerofoil type blades are more difficult to make but offer better performance and higher rotational speeds making them ideal for electrical energy generation. But to obtain the best design for wind turbine blades we can improve the aerodynamics and efficiency even more by using twisted, tapered propeller-type rotor blades. Twisting the blade changes the winds angle along the blade with the combined effect of twisting and tapering the blade along its length improves the angle of attack increasing speed, efficiency while reducing drag. Also, tapered blades are stronger and lighter than straight blades as the bending stress are reduced. Wind turbine blade design is crucial in order to make a wind turbine work as per the expectations. Innovations and new technologies used for designing wind turbine blade have not stopped here, as new formulas and designs are being considered to improve their performance, efficiency and power output daily. To learn more about “Wind Turbine Blades” and how they work as part of a wind power system, then Click Here to order your 500W 12V Off-Grid Domestic Wind Turbine from Amazon today and find out more about wind turbines, wind energy and wind generators for generating your own free power. IS THAT A JoJo REFERENCE?! Very well said, as long as they can produce a megawatt electricity. where can i get free books that can aid me more in doing numerical calculation on blade design . Your local library has free books. Just get the skull trooper and the reaper pickaxe and you’ll be good. hi bob are you a builder who can fix it?